When it’s so quick and easy to make your own beautiful fresh stock, I really find it hard to understand why anyone would settle for using generic shop bought stock cubes. 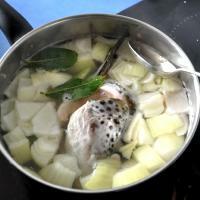 This recipe shows how to make a beautifully balanced and deliciously delicate fish stock using the left over head, bones and trimmings of white or pale pink fish such as the Salmon shown here. 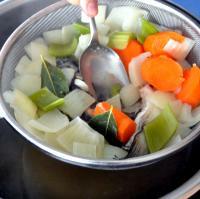 Cut the vegetables into even pieces and place in a large saucepan with the fish head. 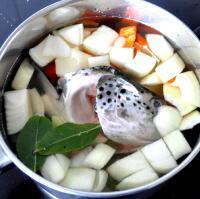 Add the peppercorns, bay leaves, wine and water to the pan. Bring to the boil. Simmer fish stock for 20 minutes only; longer cooking will make the stock bitter. During the simmering, skim off the scum as it rises to the surface of the liquid. 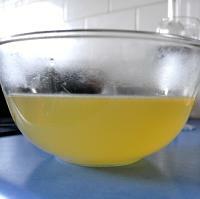 Strain the stock over a bowl. Press the solid with a spoon to extract all the liquid before setting aside to cool. Note: While you can use quite a variety of fish in this stock recipe, strong flavoured oily fish such as mackerel should be avoided. Note: In our Bouillabaisse recipe, we have replaced the wine by a tablespoon of Rum in order to bring extra flavour to the dish.